3.12.1900: Launched by Cook, Welton & Gemmell, Hull (Yd.No.282) for The Great Northern Steamship Fishing Co Ltd, Hull as ENCORE. 22.12.1900: Registered at Hull (H523). William R. Nowell designated manager. 7.5.1919: Sold to Stanley Bell, Lowestoft. Stanley Bell designated managing owner. 26.4.1920: Registered at Lowestoft (LT929). 1925: George D. Utting, Kessingland & others. George D. Utting designated managing owner. 1926: Sold to John Utting, Lowestoft. John Utting designated managing owner. 1927: Sold to Nelson G. Utting, Lowestoft. John Utting designated manager. 1928: Seasonal trawling from Fleetwood. 19.6.1928: Typical landing 45 boxes. 1930: Sold to Joseph F. Gamble, Lowestoft. Joseph F. Gamble designated managing owner. 1936: Sold for breaking up. 20.1.1937: Lowestoft registry closed “Broken up”. This entry was posted in No entries in this category on February 9, 2019 by Fred Smith. This entry was posted in No entries in this category on February 25, 2018 by Fred Smith. Because of attacks by spammers and hackers I have, after much consideration, decided to stop allowing user registration on this site and I’ve deleted all current users. I was forced to take this regrettable action after discovering a Trojan infection and browser re-direct had been embedded. I hope you will understand that this course of action is designed to protect users of this site and to allow them to continue to browse it as normal. This entry was posted in No entries in this category on July 14, 2016 by Fred Smith. 1872: Built Whitehaven for William Leech, Fleetwood as Emma Maria. 1872: Registered at Fleetwood (FD85). 1880/81: Sold to Joseph Bird, Fleetwood. 1982: Sold to Joseph Kitchingman, Liverpool. By 1887: Sold to John Davies, 20 Marmion Road, Hoylake. Fleetwood registry closed. Registered at Liverpool (LL70). 23.12.1900: Reported ashore by “61 perch” Liverpool Bay. Crew safe. Total loss. 1901: Refloated, repaired and returned to service. 1908/09: Sold to Joseph R. Foulkes, Port Dinorwic & others. Joseph R. Foulkes designated managing owner. This entry was posted in No entries in this category on May 19, 2016 by Fred Smith. 1892: Launched by Cook, Welton & Gemmell Ltd, Hull (Yd.No.90) for Hull Steam Fishing Co Ltd (64/64), Hull as MELBOURNE. 23.6.1892: Registered at Hull (H200). Henry Toozes appointed manager. 1.1913: Bloomfields Ltd, Gt. Yarmouth joined the Russian fishing syndicate, The Russian Northern Maritime Industries, the object of which was “Fishing, trading in fish and the exploitation of the riches of the sea of any kind whatever under the Russian flag’. 31.3.1912: Sold to W. A. Massey & Son Ltd, Hull, shipbrokers. 4.1913: Sold to Bloomfields Ltd, Gt Yarmouth on behalf of the syndicate for the sum of £875. Refurbished and outfitted for drift netting at a cost of £800. 2.5.1913: Hull registry closed. Registered at Archangel as PECHA (sometimes recorded as PESHA). Charles Jourieff Spahde, St. Petersburg appointed manager. 5.1913: Sailed Gt Yarmouth for Archangel (Sk.William James Empson Green); six hands all told. 5.1913: Arrived Archangel, coaled and took onboard a number of Russian fishermen. 13.6.1913: Sailed Archangel for fishing grounds. No fish found and returned to Archangel. 20.6.1913: Sailed Archangel for Barents Sea; fished but still without success. 27.6.1912: As previously agreed moved to Shetland waters and engaged with other drifters in the seasonal herring fishery. 9.1913: Arrived back in Yarmouth, Russian fishermen returned home. 10.1913: Bloomfields assumed sole ownership (64/64). 21.10.1913: Registered at Yarmouth as OCEAN COMRADE (YH405). James Bloomfield appointed manager. Engaged in the ‘Home Fishing’. 3.1914: Bloomfields informed the Russians that they would take sole ownership of the steam drifter (see 10.1913). 8.1914: Requisitioned for war service as a minesweeper but fitted out as support for A/S net drifters (Ad.No.160). 2.1.1915: Sailed Lowestoft for Dover in company with HM drifters NINE SISTERS (Ad.No.157) (LT608), SEDULOUS (Ad.No.158) (YH2) and YOUNG FISHERMAN (Ad.No.159) (LT141). 1.3.1918: Sold to William Masson (24/64), Andrew Lewis (20/64), T. Christie (20/64), all Aberdeen. Andrew Lewis designated managing owner. 3.1918: Returned to owner. Requisitioned for Fishery Reserve. 18.12.1918: William Masson shares (10/64) sold to R. Masson (10/64), Aberdeen. 1.1.1919: William Masson shares (14/64) sold to I. Masson (6/64), J.Masson (6/64), T. Masson (2/64). 2.6.1928: Sold to N.V. Visscherij Maatschappij “Beka”, IJmuiden (Broertjes en Knechtjens). 6.1928: Registered at IJmuiden as BEKA (IJM78). 2.7.1929: Sailed IJmuiden for fishing grounds (Sk. A. Groen). 31.1.1931(regd): Sold to Cols Durrant (64/64), Lowestoft. 31.1.1931: Registered at Lowestoft as OCEAN COMRADE (LT244). 2.2.1931: Sold to William Barnard (64/64), Lowestoft. William Barnard designated managing owner. 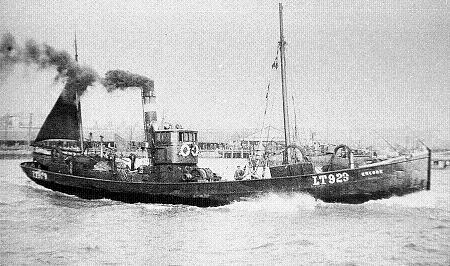 1936: White fish trawling from Fleetwood (Hewett Steam Fishing Co Ltd agents). 4.1937: Sold to German principals for breaking up. Seized by German Authorities whilst fishing. This entry was posted in No entries in this category and tagged Drifter/Trawler, No Fleetwood owners on April 30, 2016 by Fred Smith.